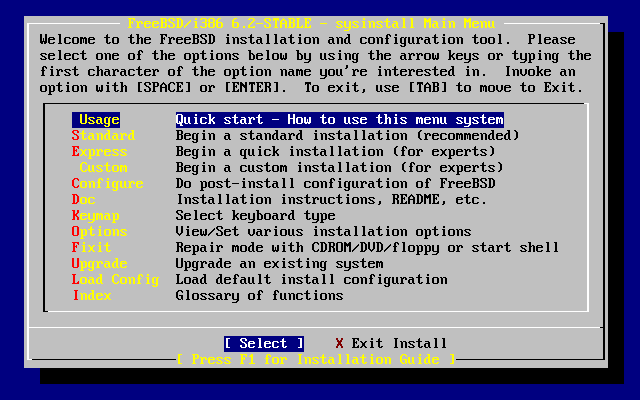 The sysinstall utility is the installation application provided by the FreeBSD Project. It is console based and is divided into a number of menus and screens that you can use to configure and control the installation process. 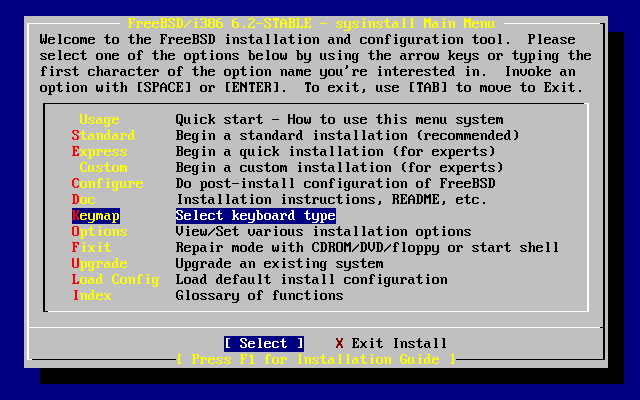 The sysinstall menu system is controlled by the arrow keys, Enter, Tab, Space, and other keys. 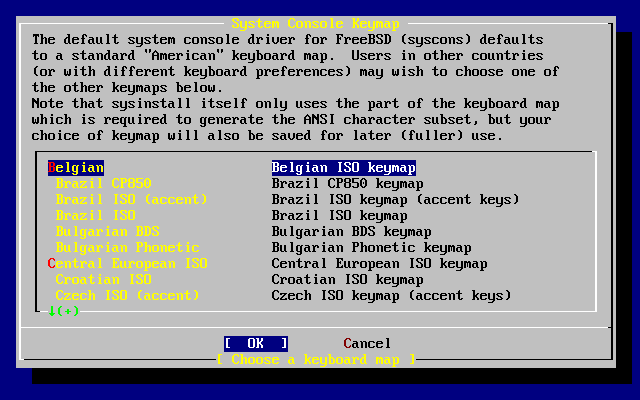 A detailed description of these keys and what they do is contained in sysinstall's usage information. To review this information, ensure that the Usage entry is highlighted and that the [Select] button is selected, as shown in Figure 2-5, then press Enter. The instructions for using the menu system will be displayed. After reviewing them, press Enter to return to the Main Menu. 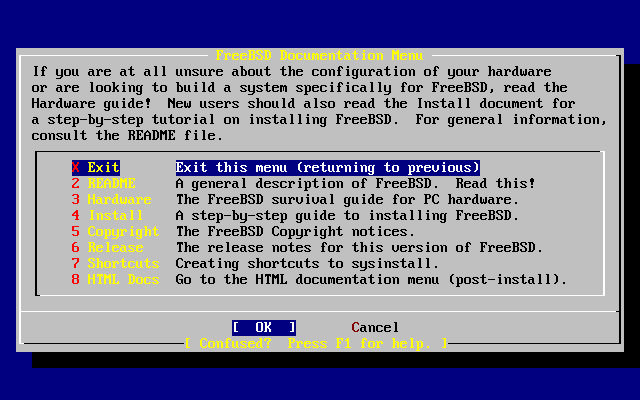 From the Main Menu, select Doc with the arrow keys and press Enter. This will display the Documentation Menu. It is important to read the documents provided. To view a document, select it with the arrow keys and press Enter. When finished reading a document, pressing Enter will return to the Documentation Menu. 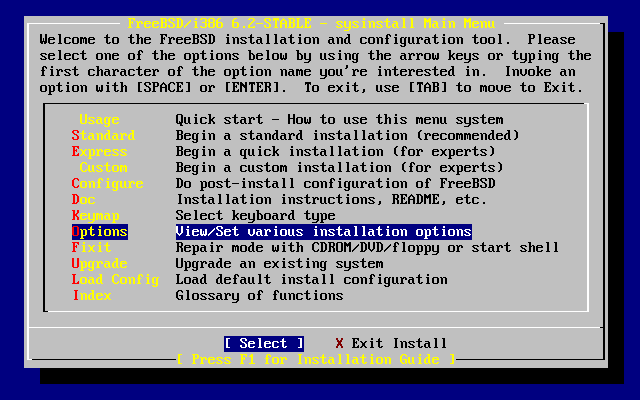 To return to the Main Installation Menu, select Exit with the arrow keys and press Enter. To change the keyboard mapping, use the arrow keys to select Keymap from the menu and press Enter. This is only required if you are using a non-standard or non-US keyboard. A different keyboard mapping may be chosen by selecting the menu item using up/down arrow keys and pressing Space. Pressing Space again will unselect the item. When finished, choose the [ OK ] using the arrow keys and press Enter. Only a partial list is shown in this screen representation. Selecting [ Cancel ] by pressing Tab will use the default keymap and return to the Main Install Menu. Select Options and press Enter. The default values are usually fine for most users and do not need to be changed. The release name will vary according to the version being installed. The description of the selected item will appear at the bottom of the screen highlighted in blue. Notice that one of the options is Use Defaults to reset all values to startup defaults. Press F1 to read the help screen about the various options. Pressing Q will return to the Main Install menu. 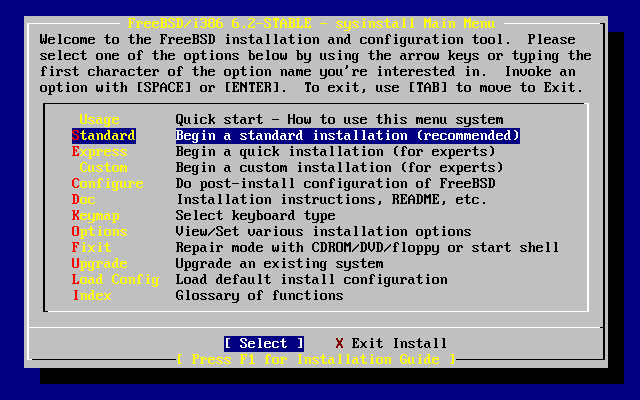 The Standard installation is the option recommended for those new to UNIX® or FreeBSD. 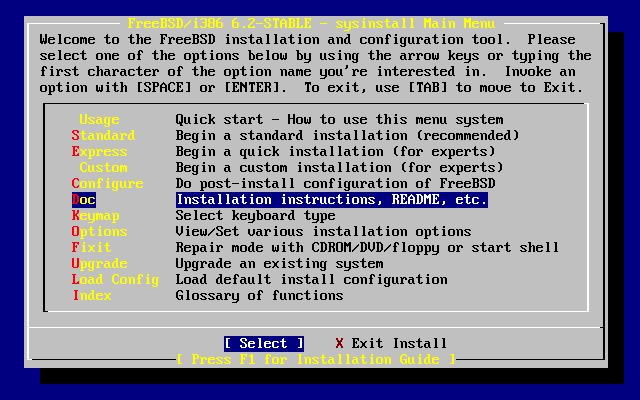 Use the arrow keys to select Standard and then press Enter to start the installation.